I could say all kinds of things about the US election results. I feel all kinds of things. Fear. Shock. Worry. Pressure. Responsibility. While Trump truly is #notmypresident, a border does not separate us from humanity. I am devastated and afraid about what is happening in America for all of us. For those experiencing all of the horrible discrimination, hatred and fear in the U.S. right now and for the influence America has on the world. I worry for the American children who are worried. For the children and their families who have experienced discrimination and see it getting worse. I worry for our Canadian children who feel their own fear. What about here? Can that hate come here? Is it here already? How safe are we? Safety feels turned on its head. Hatred feels like it got a green light. It’s early days. He’s not even the President. People are talking about feeling afraid to walk outside. I am a mother. I am a teacher. I am a person who has spent her life advocating for children. Fear can freeze us. We need to release ourselves. Begin doing something to make a change. Sometimes, this means something completely new. Yes, do those things. Speak up when before you didn’t. Don’t ignore what you might have in the past. Engage in the hard conversations. Be uncomfortable. Sometimes, it is to repeat what we know. Don’t stop what you already do to make a difference. Continue. It is now even more important. This is what I celebrate today. That despite my fear, I am not turning in circles helplessly. I know where to start. It is in my classroom full of books. I can walk back into my classroom Monday morning and talk about books. I can book talk. Read aloud. Provide hours every week for independent reading time. Words reassure. They challenge our thinking. They shake things up. They soothe us and make us question the world that we know. I can offer this gift endlessly. Stories do their magic thing. They touch us where we are most human. They remind us to think deeply. To feel in mighty ways. Our children need this. Time and space to grapple with their questions and their worries. Stories to let them see the most in themselves and in others. So often I focus on picture books as the place to begin. My students are always immersed in picture books. Please immerse yours! Today my recommendations focus on chapter books for our intermediate students. Middle Grade novels. These are the titles I want to see in the hands of my Grade 4 and 5 readers and are actually on my shelves (or soon will be). I have read every one and recommend each of them. All of these books remind us, we have no time for judgement. We must make room for kind. We are all so very different and that’s what makes our world. Read. Share. Talk. Over and over and over again. Listed in no organized order. I just started typing. 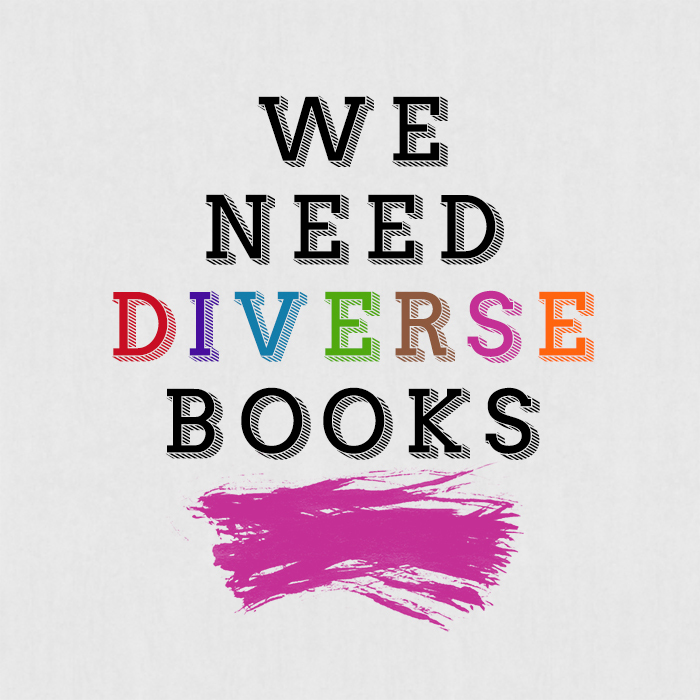 For many more titles, visit the We Need Diverse Books site. They are many resources and book lists featured there. Number 1 seems particularly meaningful now: Read about a character who doesn’t look like you or live like you. This entry was posted in Celebrate this Week, Diverse Children's Books, Novels, Thoughts and tagged Celebration, Diverse Children's Books, Gene Luen Yang, middle grade novels by carriegelson. Bookmark the permalink. I just wrote about reading as part of what we can do in my Poetry Friday post, Carrie, to learn about others we don’t know well, to learn that we are all together, with differences we can respect and gain sympathy for. Great list, thoughtful words! Thank you! Not surprised we are thinking the same thing this week Linda. Love the list you curated, Carrie – we can reach our kids through understanding their stories. Thanks Tara. It was nice to create a list where I can personally recommend all of the titles. I have to repeat what Tara said. Love love the list. Love those books. Thank you Julianne. I am sure many of us are amping up our book sharing right now. Your recommendations are always an inspiration to me. You turn the fear and sadness into hope and power of reading. I celebrate the magic of stories. Thanks for this book list. And for continuing to celebrate putting books in the hands of the students. So many titles I love in your list. And still some I need to read. Love the idea of challenging our students with The Reading Without Walls Challenge. It’s a fantastic challenge. Yang really has a wonderful platform. Thank you for your post. It’s nice to have a Canadian ally 🙂 I share your range of feelings, from despair to resolve. Although the majority of my students are secondary, not primary targets, of the worst of this election’s rhetoric, they are hurt and confused. As librarian, I leave the in-depth processing to the classroom teachers but nonetheless there were pop-up conversations. The ironies and hypocrisies of the campaign were not lost on our ten-year-olds, the ridicule of entire populations not lost on our 2nd and 3rd graders. As others have said this is a wonderful list, many of which I’ve read, most of which our library owns, and several I’ll add to my list. One that I would add to your list is Mockingbird by Kathryn Erskine. I agree Mockingbird would be a fantastic addition. YES – it’s all too easy to sit here smugly in Canada and wag our fingers at our American neighbours, but the reality is that we can all do our part to spread love, compassion, empathy and understanding in our communities, no matter where we live. Thank you for this post. Yes, and to speak up and have those challenging conversations. If this election can happen here in the US, it can happen anywhere. The tide has already started to turn that way in many countries around the world. That makes this week’s blog ever more important. Books are such an amazing vehicle for learning about each other. You have put together quite a list, many of which I’ve read and many I have not (yet!). Thank you! I hope you might get to some of these not yet read titles and enjoy them as much as I did. Words are important. Stories help us sort out our feelings. What an amazing list of books you have collected and showcased. Thanks. Thank you Carol. I hope that this list will be a helpful place to start for people who want to add to their collections.